I threw on a vintage, 50s dress, and skipped away to the event in the company of Michael. His wife Fanny joined us later. The party was held at Häktet's outside bar, situated in a closed-in yard in the middle of Stockholm. Very cozy! Here is Martin Kellerma himself! Signing copies of some of his collected work through the years. The best clutch of the evening looked like an old newspaper, and was owned by Tia! Now Rocky also has his own wine! I tried the red one at the event, and it tasted just fine! I love your dress Miss Meadows, you look amazing! 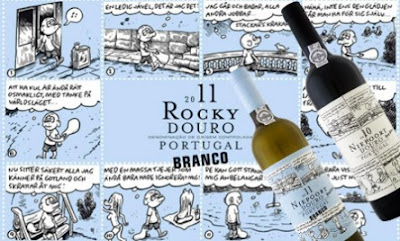 I'd never heard of Rocky before but 15 years is an incredible and amazing achievement in that business and I'm glad they celebrated it in style, I can't believe they've got their own wine now though, that's so awesome! Fräulein Frauke Presents: Hooray for Hollywood!